Whether you’ve lost one tooth or a full row of teeth, the Ten Mile Dental team in Frisco can help you replace lost dental structures and renew your oral health. In order to renew your oral health and dental function, we typically recommend a dental implant tooth replacement plan to replace both your tooth roots and crowns, recreating your healthy, flawless smile. If you’re interested in finding out more about your dental restoration options, call to schedule your tooth replacement consultation with our caring dentist and team today. We’ll review your situation and help you to determine whether or not an implant supported tooth replacement plan is right for you. Why is Single-Tooth Replacement Important? A single-tooth implant restoration plan utilizes an implant post to support a custom-crafted dental crown. These natural looking and functioning restorations allow us to fully renew your smile and ensure the optimal level of oral health. 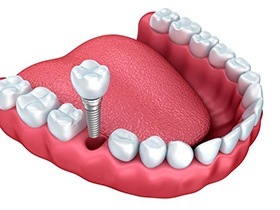 How are Single-Tooth Implants Placed? Single-tooth implants are placed over the course of several phases of treatment. The first is the preparation phase. 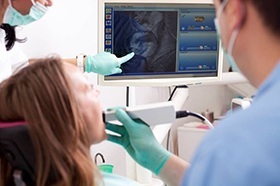 This may include extraction of the damaged or decayed tooth, treatment for oral health concerns like gum disease, and placement of bone or soft tissue grafts to ensure the best chances for successful implant placement. Additionally, we’ll review your medical history, medications, and past surgical experiences to ensure we’re fully prepared to deliver exceptional results. Once the preparation phase of treatment is completed, we’ll place your dental implant post. Once in position, your implant will need time to fuse with the supportive structures before we can attach your custom dental crown. Once the implant is fully fused with supportive bone and gum tissue, we will design, craft, and place your dental crown, delivering a flawless smile. What are the Benefits of Single-Tooth Implant Restoration?